Twice the space on one footprint! Your brand new two-story building has only ONE limitation... your imagination! Our two-story structures offer endless possibilities. Choose between our garage or workshop packages. 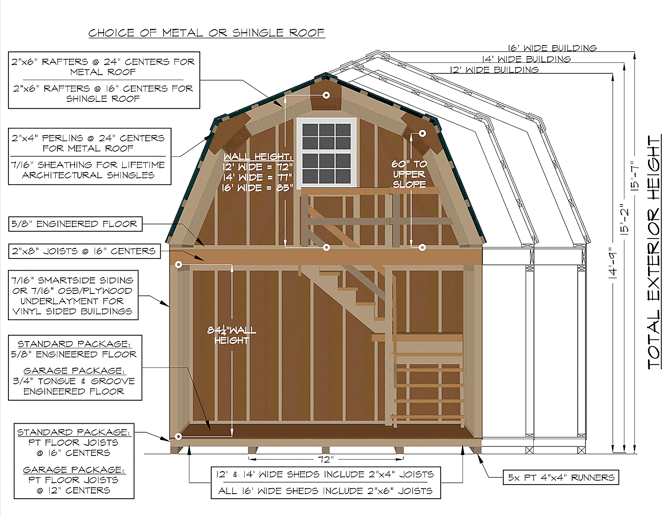 You can even add a lean-to roof to the side to add extra storage and protection from the elements. Now also available with a Cape Cod style roof. Whatever style and options you choose, all Two-Story Buildings come with plenty of space! Wondering how delivery works? The first floor of your two-story structure is delivered assembled. Once the first floor is in place, we'll assemble the second floor on site. Normal assembly time is 5-7 hours. Complete on-site assembly is also available if you do not have delivery access. Include a 9'x6'6'' Garage Door, two 36'' single doors, two 30''x36'' windows with shutters, 12'' on-center floor joists, 3/4'' TG first floor, and interior staircase. 16' wide buildings include 2x6 first floor joists standard. Shown with classic sand vinyl siding, clay trim, green shutters, and clay metal roof. Shown with beige Smart Side siding, pc clay trim, avocado doors & shutters, clay metal roof, and sandstone garage door. Options shown: transom windows in entry doors and diamond tread plate at garage door. Standard Two-Story Workshop Style Gambrel Barns include a 6'x6' Double Door, two 36'' single doors, two 30''x36'' windows with shutters, and interior staircase. 16' wide buildings include 2x6 first floor joists standard. Customized your structure to fit YOUR needs. Talk to your local sales lot manager on how to customize your structure. Shown with pc clay Smart Side siding, red trim and shutters, and a red metal roof. Options shown: Extra windows and 9-Lite entry door on first floor. Shown with pc clay LP Smart Side siding, hunter green trim and shutters, and green metal roof. Options Included: Cape Cod style roof, 8' lean-to, additional windows, 9-lite door, and house lock set. 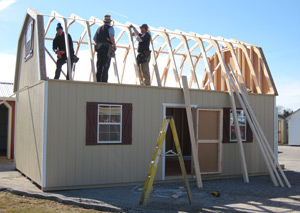 The bottom half of your two-story structure will be delivered assembled and set in place. Then the top half will then be assembled on site. Normal assembly time is about 5-7 hours. Complete on-site assembly is also available if you don't have delivery access.